Orange_Binders is rated 5.0 out of 5 by 1. Rated 5 out of 5 by Mocl27 from Perfect for all my classes! I needed different color binders for each of my classes to help keep organizes, and these are perfect! The orange is my favorite! 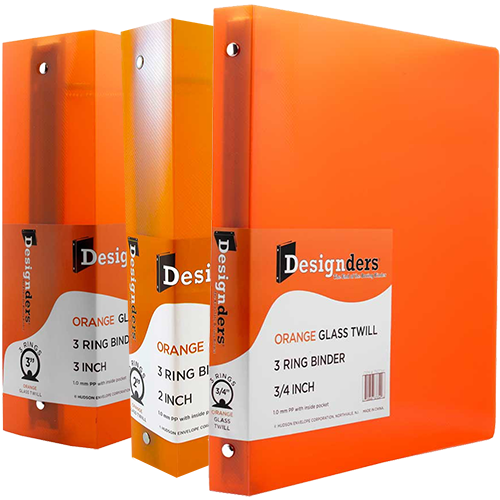 Brighten up your office organization with some awesome three ring Orange Binders! The color orange represents happiness, so when your feeling down at the office or at school, just take out these binders and feel the sunshine! Orange Binders come in: 3/4 inches, 1 inch, 1 1/2 inches, 2 inches, and 3 inches. This way you can decide if you want to keep it small for that one presentation that needs all the attention it can get or large for when you want to keep all your subjects in one place. You can even match your small binders with your large to create a uniform yet happy look! Our 1 Inch Binders come in Glass Twill and Linen, the rest come in only Glass Twill. But don't worry! Our glass twill binders will surely protect with the durable plastic that surrounds it. So you won't have to worry about those important presentations or essays getting ruined. Check out our binder collection for more colors, more styles, and more sizes!